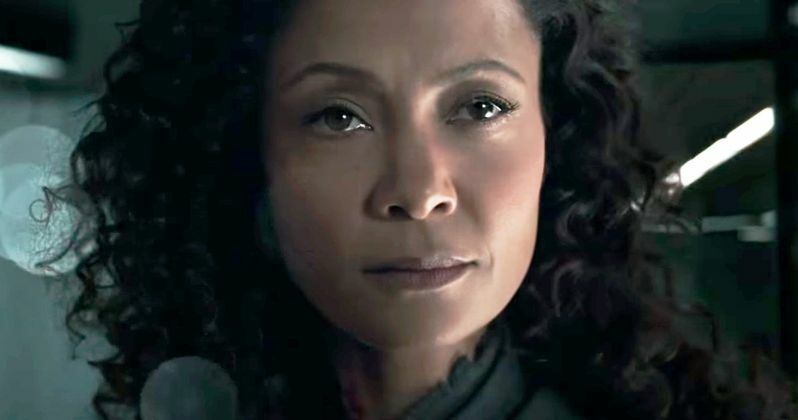 While some of the biggest Super Bowl ads are for some of this year's biggest movies, HBO is shaking things up a bit by dropping a trailer for Season 2 of Westworld. This ad marks the first time in HBO's storied history that the cable network has dropped the big bucks (reportedly over $5 million for a 30-second spot this year) to promote what may be the most highly-anticipated seasons in all of television. The new trailer also finally revealed the premiere date of April 22, 2018 as the countdown continues towards this show's return. The Super Bowl trailer preview released earlier this week didn't showcase any actual footage, but features a Delos computer screen rebooting, with a number of cryptic messages, but the last two are rather intriguing. While the first few messages were from "Registered Users" from within the Delos system, the last two are identified as being from Charlotte Hale (Tessa Thompson), the Executive Director of the board of Delos Destinations, Inc. In the first season, she tried to sneak the data from the hosts out of Westworld, in an effort to take over the resort, with this message revealing that, "Narrative unveiling successful, all is well." The second message stated that, "Ford took it in stride. Restructure/management downsizing on track." This Emmy-winning one-hour drama series is a dark odyssey about the dawn of artificial consciousness and the evolution of sin. The season one cast included Anthony Hopkins, Ed Harris, Evan Rachel Wood, James Marsden, Thandie Newton, Jeffrey Wright, Tessa Thompson, Sidse Babett Knudsen, Jimmi Simpson, Rodrigo Santoro, Shannon Woodward, Ingrid Bolsø Berdal, Ben Barnes, Simon Quarterman, Angela Sarafyan, Luke Hemsworth, Clifton Collins, Jr., Talulah Riley and Louis Herthum. Joining the season two cast are Katja Herbers, Gustaf Skarsgard and Fares Fares. Production was briefly shut down back in December, due to the massive wildfires that swept through Southern California. Westworld was created for television by Jonathan Nolan and Lisa Joy, based on the film written by Michael Crichton. The creators serve as executive producers with J.J. Abrams, Athena Wickham, Roberto Patino, Richard Lewis and Ben Stephenson. Production companies, Kilter Films and Bad Robot Productions in association with Warner Bros. Television. Season two begins this spring. HBO first showcased footage from this new season back in August, which was only comprised of a few shots, but it was definitely enough to pique the interest of the fans. The footage featured Maeve (Thandie Newton) holding a gun to a man's neck, along with native warriors trying to topple a massive bear. Season 2 started filming in July 2017, with filming taking place on location in Utah and California. The first season was nominated for 22 Emmy's, the most of any other program, although it was shut out of the main awards, winning four Emmy's in technical categories such as sound mixing, makeup, hairstyling and visual effects. Take a look at the new WestworldSuper Bowl trailer below, courtesy of HBO, as we wait for more details on this new season.